Oh what can I say, sometimes things just don't come out as pretty as I hope. This is one of those times. While it is "cute" it's not quite hitting the quality control button. First I kind of accidentally did a wrap and turn at the ends of the rows where the mouth is and carried the tan across. Second, I didn't bother to dig up white that matched gauge as well as it should have (ACL surgery prevents me from over exertion). Needless to say, it's completed project. It was a bit of a prototype anyway. DH likes it even though it's a bit small. To save a bit of space I didn't put the picture of the back; if you're on Ravelry and want to see it go to my project. 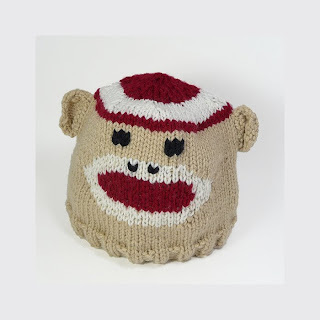 While I did do quite a few moderations, the original pattern can be found here at Knitty.